In some businesses you need agents or distributors working in that capacity to sell your goods or services. In others, the best business might be gained by using someone who is probably not a professional salesman but who “just happens” to be in a position to help. This agreement is most likely to be useful to a business selling high value goods or taking high value orders. Someone working in the property industry who can alert you to buying opportunities. A supplier of goods to a retail chain who can tell you there might be demand for your products as well. An IT hardware consultant who becomes aware of a large contract for software services which you could provide. The relationship could be one-off, intermittent, or regular. 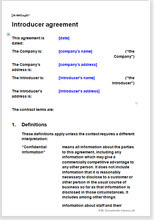 This agreement has been drawn for a business relationship which is not that of a standard sales agent. This agreement places no obligation on the finder to sell or produce orders nor grant him any rights to use your intellectual property. On the contrary, it protects you from his competing with you. You will pay him a commission on sales, for which we have provided a procedure with several options.